Before I began building my greenhouse shed I did some research into what makes a good greenhouse. Among many important aspects like positioning (for ideal sun), materials, and passive heating I learned that a porous surface for flooring is essential. It makes sense, plants need water - plants will drip water, it has to go somewhere! In my greenhouse shed I started with the goal of finding good flooring materials that would give me a hard surface but still drain well. Free bricks were part of that solution and will fit in nicely for the walkways but I still needed something for the "shed" part. The shed section is an area of the greenhouse that will house my mowers and lawn equipment. So I came up with this idea, a raised platform that is level with the back entry. 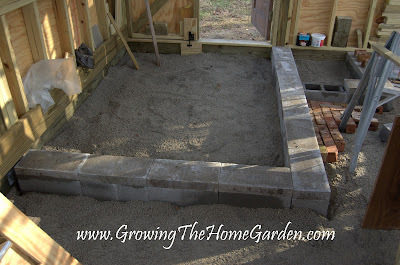 The platform is edged with heavy concrete blocks and cap stones that will contain gravel. The following picture is where the riding mower would enter the greenhouse. 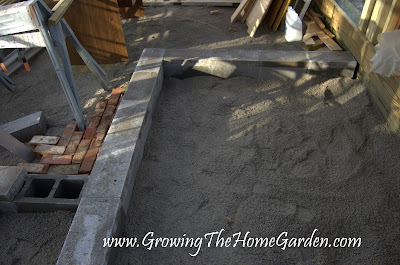 The concrete blocks will hold the gravel and keep the two areas defined. Next to the main mower pad is a smaller pad that needs one more cap to finish. This will be where the push mower sits when not in use. Keeping the mower in the greenhouse may not be ideal but it will give me a place to store it and I'll have a spot for all my plant propagating! The main floor and walkway will be covered in bricks and paving stones for a clean and solid surface to walk on. 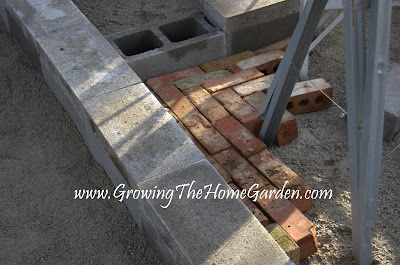 The addition of the stone and bricks should help to retain more heat throughout the day during the winter. 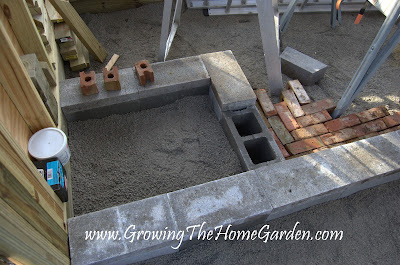 The recent warm weather, which still hasn't made up for the recent cold weather, has helped me get a few more things done like the concrete blocks. They are loosely set and I don't plan on mortaring them - I want the option of moving them if I need to later. The bricks are just set temporarily while I play around with patterns. I can't wait to see how it all fits together! Coming right along.... I can't wait to get out and be able to make something in the yard. We still have a few months so I will keep admiring your work! Gonna be just great Dave! I have a lot more work to do so having more time before seed starting and planting is a good thing. Putting the mowers in the greenhouse is ideal because it gets them out of the garage! Great idea for the floor Dave. I agree with Jenny--getting things from the garage is a big plus. I had a shed built to put my plants in in the winter but it has wound up filled with everything else--even other peoples stuff.